Intermittent fasting may be the latest and greatest trend in the health world, but it is old news for those of us at Isagenix. The very science behind intermittent fasting helped initiate the inclusion of Cleanse Days as a foundation of Isagenix’s weight loss systems. “Intermittent fasting” is a style of eating that involves eating within a specific time period and fasting for the remainder of it. Many enjoy fasting due to the flexibility it offers. Intermittent fasting is also an effective alternative to traditional calorie counting as it places the focus on when and how much you eat, not just calories. Between meals, insulin levels can go down and allow fat cells to release stored up sugar to use as energy. This process can lead to weight loss. The main idea behind intermittent fasting is allowing insulin levels to go down far enough and long enough to burn off stored fat and achieve weight loss. The growing interest in intermittent fasting has brought about a wide discussion on the different ways to incorporate intermittent fasting as part of a healthy lifestyle. Below is a quick breakdown of some of the more common methods of intermittent fasting, with time-restricted feeding and whole-day fasting being the two methods with the most scientific support. The 16:8 Method – With the 16:8 method, the most popular type of time-restricted feeding, eating is limited to an 8 hour per day time frame. In this fasting style, individuals tend to consume two meals during the 8 hour window, automatically resulting in a reduction in total calories eaten. Every-Other-Day Diet – Individuals following the every-other-day method of fasting normally eat one day and fast (consuming 500 calories or less) the following day. Although this method does help limit calories, some individuals find it restrictive and difficult to stick with. Whole-Day Fasting – Whole-day fasting is just as it sounds – drastically limiting calorie intake for an entire day. The majority of research suggests a 300 to 500 calorie total as an effective strategy. 5:2 Diet – The 5:2 diet involves 5 days of unrestricted eating and 2 days of fasting (500 calories or less). This method can be helpful, as long as individuals do not consume excessive calories on the five days of normal eating. Growing research supports the potential benefits of intermittent fasting. Although some in the scientific community argue that intermittent fasting is no more effective than traditional calorie restricted diets, intermittent fasting offers the added benefits of flexibility and other health benefits. Why Should I Include Isagenix in my Intermittent Fasting Routine? While the proven science surrounding intermittent fasting led Isagenix to include intermittent fasting from the beginning, the Isagenix System takes this approach even further. Here are 3 reasons the Isagenix line can take your intermittent fasting to the next level. 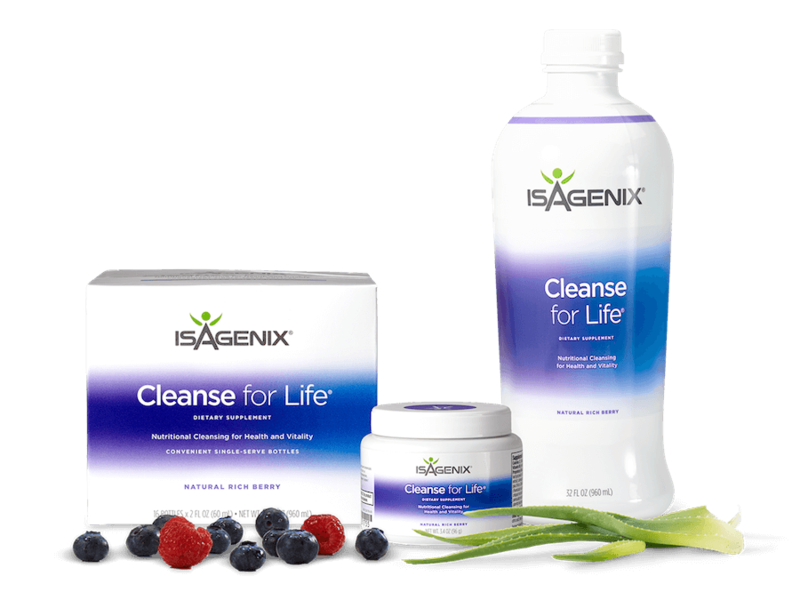 Convenient, Complete, Unique Nutritional Support: To make your cleanse days even more efficient, Isagenix formulated Cleanse for Life. This carefully crafted blend, rich in phytonutrients, was specifically designed to provide targeted nourishment and reinforce the body’s natural detoxification process. Cleanse and Shake Days: Isagenix allows you to boost the benefits of intermittent fasting with the powerful combination of restricting calories on Shake Days and intermittent fasting on Cleanse Days. It Floods Your Body With Nutrients (Rather Than Focusing Purely on Restricting Calories): Most fasting regimes severely limit the amount of calories you consume. Whilst Isagenix does that on Cleanse Days, it also provides substantial nutrients for your body to properly function. Instant Support Team: Incorporating healthy changes into your lifestyle can be daunting and overwhelming, especially if you are doing it alone. Fortunately, Isagenix understands the importance of community support and makes sure to have a team behind you supporting you each step of the way. Whether you choose to follow the 16:8 method of intermittent fasting or Isagenix’s traditional Shake and Cleanse Day format, Isagenix products can make an effective, delicious addition to your plan. By providing high-quality nutrients, customization, and ample support, Isagenix can get you closer to achieving your health and wellness goals.